Innovate BD Red Gauge Kit (DB Gauge, LC-1, & Sensor). 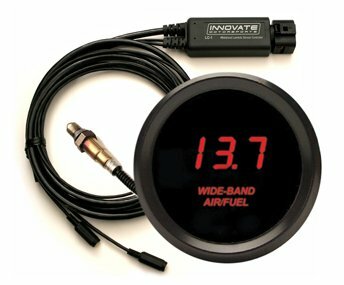 In partnership with Nordskog Instruments, Innovate Motorsports is releasing two new 52mm (2 1/16) air fuel gauges. Each gauge features a bright LED (available in blue or red). Each kit includes the gauge, an LC-1 wideband controller, oxygen sensor & bung/plug, and the award-winning LogWorks engine-tuning software. -The industry's most accurate and fastest-responding wideband controller. -One additional available analog output (one connects to the gauge). -Easy set up and wiring (instructions included). -LC-1 incIudes Innovate serial in & out for adding additional modular tuning system (MTS) components. (Gauge itself is analog only- no serial). -Log directly from the LC-1's digital output into laptop w/included software.